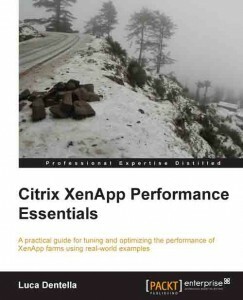 While writing my own XenApp Cookbook for Packt Publishing, I found the time to read another great XenApp book: Citrix XenApp Performance Essentials. So here’s my review on the book. The book consists of 5 chapters and it starts with design guidelines to IT Architects to design a good XenApp infrastructure. The other chapters in the book focus on improvements and optimizations Administrators can implement to optimize server performance, session start-up time, end user experience and WAN connections. The first chapter focuses on the design of a XenApp infrastructure, which in my humble opinion is the most important phase for your XenApp infrastructure to determine how it will perform. A bad design decision can haunt the infrastructure during its entire lifetime. Luca has done a great job addressing the most important design decisions an Architect has to make during the design phase and sharing his vision and advice on the subject. The information he provides on the many components that build your XenApp infrastructure allows Architects to understand the role each component has and make a solid design decision. I also like the style Luca choose, to offer information and suggestions and not mandate the design. A must read chapter for XenApp infrastructure Architects! The other four chapters in the book focus on the improvements and optimizations Administrators can check and implement in a production environment. Luca start off by explaining the different monitoring tools you can use to check the performance of your XenApp servers and additional infrastructure components, like the License server and Hypervisors. I like this setup to focus first on getting the right performance counters and then look at ways to improve the performance when required. The book advices Administrators to get to know the XenApp infrastructure and help them to understand what tuning might or might not be effective by providing in-depth explanations for each optimization setting. Not only does the book focus on server performance, it will run you along all components by focusing on session performance, end user experience and WAN connections as well. This covers the entire flow from server to client and checks each contribution to the experienced performance by the end user. Each tool to check the performance is explained in detail, which makes it an even more valuable book to have when you want to focus on XenApp performance improvements. I for one have added this book to my resource library and expect to use it as a reference quite often when designing and troubleshooting XenApp infrastructures.